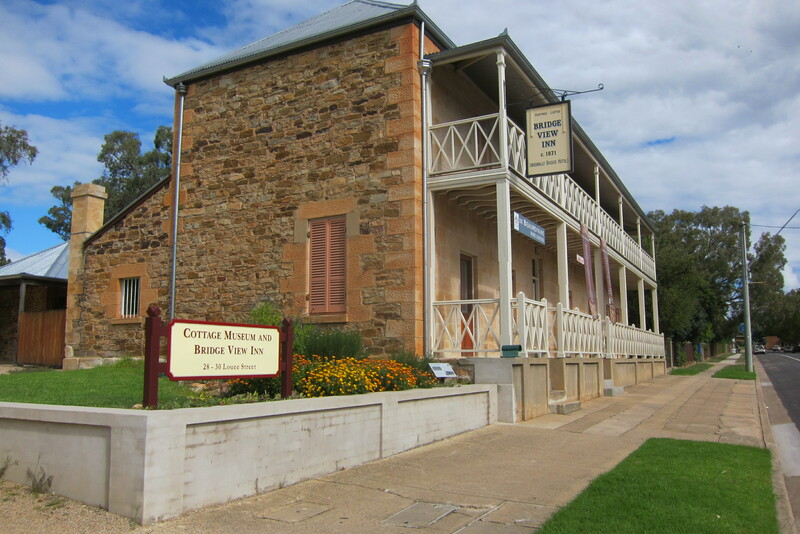 The Historical Society owns the Bridge View Inn, one of Rylstone’s gorgeous sandstone and random rubble buildings. The Bridge View Inn and related structures were built between 1865 and 1885, giving a unique character to the town of Rylstone. 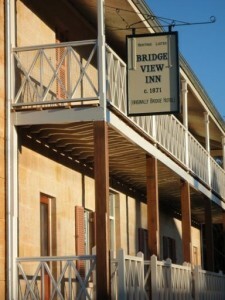 The Bridge View Inn was opened for business in 1872 by Goodwin Spires HALL. HALL arrived in Rylstone in 1867 with his wife Mary Ann, brother James and James’ family, and Mary’s sister and mother, all of whom had been living in Sofala where HALL operated a pub. He clearly did well from the goldfields. HALL first operated the Beehive Inn at 29 Mudgee Street, Rylstone, until the opening of the Bridge Hotel. In 1868 he purchased the 2 blocks of land where the Bridge Hotel was erected. Given that the population of Rylstone was less than 200 people, building the two-story Bridge Hotel was a huge expression of confidence in the future. HALL ordered dressed sandstone blocks for the front, and an interior boasting a cedar staircase, cedar doors, cedar cabinets and window casings. He commissioned a wonderful mural for the bar parlour featuring a portrait of the timber bridge over the Cudgegong River opposite the hotel at the end of Hall Street. The building had five stone fireplaces, and a kitchen wing with large fireplaces and a bread oven. He was obviously expecting good business. But HALL may have overextended himself for he was in financial trouble by 1875. HALL put the building and business up for sale. He eventually remortgaged to the Australian Joint Stock Bank, and his brother James took over as publican from 1876 to 1880. The building was used as a hotel until 1894, with a succession of lessees. Goodwin HALL died in 1891, his estate still owing money on the building. With the onset of a depression, mortgage payments fell into arrears and the Bank repossessed the building. The Australian Bank of Commerce (ABC) then moved in, converting the Bar room to a banking chamber, and the Snug (ladies’ lounge) behind as an office and safe room (hence the bars on the windows). The rest of the building housed the bank manager’s family or other employees. This use continued until 1957. In 1958, the building was purchased by Christopher and Myrtle (Merle) FINK for use as a family home. However, Mr FINK, a manager at Kandos Cement, died in 1962. Merle eventually sold the building in 1967 to the trustees of Rylstone Historical Society: William Francis “Bill” STAFF (teacher, of Rylstone), Marjory Molyneaux TAYLOR (widow, of Kandos), Vincent John NEVEL (dentist, of Clandulla) and George William McDONALD (grazier, of Rylstone). The Society opened a museum in the building in 1970 but, finding a need for an income stream to maintain the building, eventually leased it to a succession of restauranteurs and artists. They later reopened the museum in the ‘Cottage’ in 1988. After the Rylstone and District Historical Society acquired the Bridge Hotel in the 1960s, conservation and restoration work was undertaken on the building. The building is listed by the National Trust, is on the local and NSW Heritage Register, and is subject to a Permanent Conservation Order. A mural over the fireplace came to light in the late 1990s, in what we now call the Dining Room, which had been covered by wallpaper for almost 100 years. The mural, believed to have been painted between 1872 and 1894, is a unique piece of Australiana and an important record of the history of Rylstone. The central cartouche contains a naïve depiction of the Cudgegong River bank with a fisherman and some cattle. At the centre is the distinctive timber truss bridge over the river that was once the main entry into the town and directly opposite the Bridge Hotel. The cartouche is surrounded by a decorative border of acanthus leaves, two nymphs and a horned satyr’s head. Satyrs and nymphs were associates of the Greek god of wine, so entirely appropriate decoration for a drinking establishment. The mural is believed to have been painted by Augustus Baker Pierce (1840-1919) and has been recently conserved. Since 2006 considerable work has been undertaken to the Bridge Hotel, now known as the Bridge View Inn: reroofing, upgrading of toilets, a new front verandah, reworking of the courtyard and front paving, and upgrading of plumbing and electrical services. The Bridge View Inn will be 150 years old in 2022 and remains in pretty good shape thanks to generous grant funding and the ongoing commitment of RDHS members. The Bridge View Inn hosts bed & breakfast accommodation, a yum cha café, Thai massage and a barbershop.